Reo Pure filter systems utilizes the most advanced reverse osmosis process available today. The reverse osmosis method of drinking water treatment has long been regarded as one of the most efficient ways to reduce impurities. Water passes through an efficient pre filter that removes the larger particles of dirt and debris. Then, the water is squeezed through microscopic pores in the reverse osmosis membrane eliminating up to 99% of the impurities. Finally, the carbon post filter removes objectionable tastes and odors to enhance the quality of your drinking water. 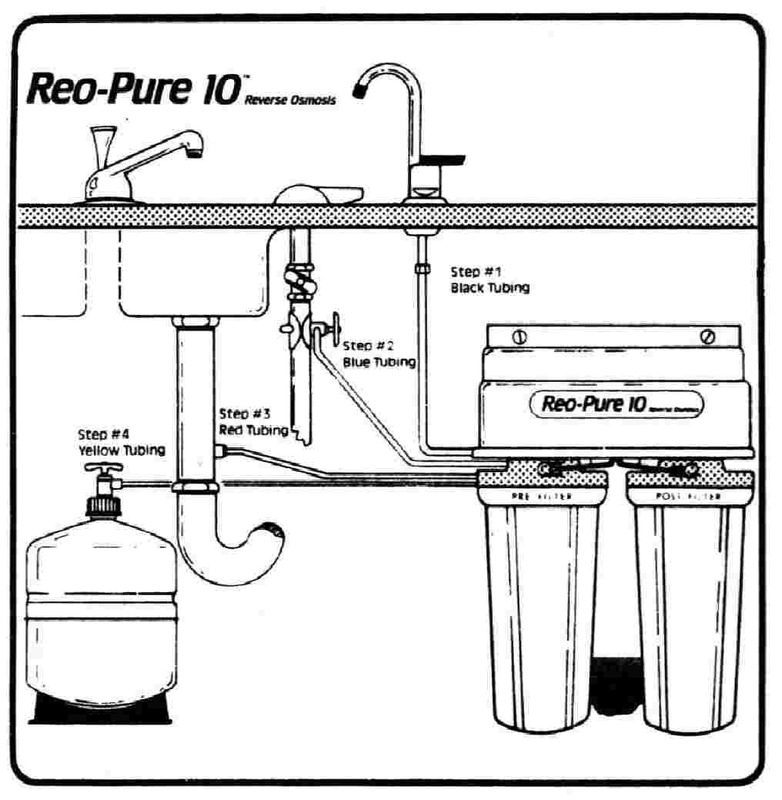 ALL REO PURE REVERSE OSMOSIS SYSTEMS COME COMPLETE WITH INSTALLATION FITTINGS AND COMPLETE INSTRUCTIONS. THE INSTALLATION PACK INCLUDES STORAGE TANK, SHUTOFF AND TAP SADDLE VALVE FOR WATER SUPPLY CONNECTION AND DRAIN TAP SADDLE FOR DRAIN CONNECTION AND TUBING. Reo Pure filter system can be tested and certified by you with your own TDS water tester. Results: Reo Pure filter system can remove 95-99% of dissolved material in the water. Reverse Osmosis is a process in which water is forced by pressure (at least 30psi) through a semi-permeable membrane. The good water passes ("squeezes") through a special membrane while the dissolved and particulated materials are sent down the drain. "What type of faucets do the above RO come with?" Reo Pure units are shipped with either a high spout built-in air gap faucet (Extra Charge) for certain city codes or a high spout non air gap faucet, your choice. Non air-gap faucet present less problems in the long run. The air gap is built in (underneath) this faucet (for prevention of contamination of the waste touching drinking water). When shopping for reverse osmosis systems, be sure to check what type of faucet dispenser is included. "I have an RO system and there is water coming out from underneath the water dispenser faucet. What is wrong?" More than likely you have an air gap style faucet. This is a safety feature. If there is any kind of clog or kink in the RO drain line, water will come out from under this style of faucet. "What if my hardness is greater than 12 grains per gallon?" If your water is harder than 12 grains per gallon, then it will tend to foul the RO filter prematurely and will void any warranty. This is the case with almost all makes of RO systems. If your water is that hard we would recommend a water softener. "I've seen RO units that cost less than yours?" Yes, we could have a lower priced RO as well. If you have spent any length of time looking at our online catalog and the internet we know that you have seen how low our prices are. When deciding what RO to offer we decided that lowest priced models aren't necessarily a bargain in the long run. Filter availability is important. Reverse osmosis systems need new membranes and filters on a regular basis. for example, Can you take your RO from California to New York and still find filters? Before your purchase that $100.00 RO check the membrane life. 1 year membrane life makes the unit much more expensive to operate. Make sure to compare those prices and ratings as well.Click here to see Reo Pure Filter Life Guide Our customer satisfaction rate is very important to us. We think you will agree that buying a "foreign, cheap" unit isn't necessarily a bargain in the long run. REO PURE RO units are MADE IN THE USA! "My RO continues to run. What is wrong?" Check the storage tank; it might not have enough air in it. The tank should have between 8-10 lbs of air in it when empty of water.There is also an Auto Shut Off valve that can cause the same problem. "We have been considering buying a large 'whole house' RO system. Would the largest RO units that you offer work for our main water line. ?" Our largest RO is for a whole house application. We offer a line of whole house Reverse Osmosis system for any need. "I just installed a new filter cartridge and my water is cloudy/white?" After you install a new filter (this is the case with any/all brands of filter cartridges) you should run the cold water for a few minutes. Generally cloudy or white water indicates air in the line and this is natural and normal with the replacement of a cartridge. Air will enter in the housing, lines and cartridge. Just run the water for a few minutes and the cloudy conditions will go away. It is always a good idea to run the water free-flowing for a few minutes after installing any brand or type of new filter cartridge. "Ok, I installed my RO and have my faucet open but I'm not getting much water. I do hear water running down my drain pipe but I'm not getting much water out of my faucet. What is wrong?" Nothing is probably wrong. The reason is that the tank on a residential RO system takes a longer time to produce RO water on initial installation. The faucet needs to be in the off position and then the tank will (very slowly) fill. Close your faucet and wait a couple of hours for the unit to produce water. Once the tank is filled, the unit will replenish the water as you use it. "I bought a Reo Pure RO unit 20 years ago and the local company went out of business. Can you help me?" We can cross reference the unit by the model number and provide replacement filters. "How often should I replace my filters.?" This is a very common question. It depends a lot on your water conditions, water quality and your usage. We believe that in no case (no matter what brand that you have) should you keep the Pre-Filter longer than a year (changing it every six months is better).